The Safety Building was designed by local architect Olof Z. Cervin, who was also an owner. Mr. Cervin said that this was the first time reinforced concrete was used for construction in the Quad Cities. The concrete was used for floors, ceilings, roof, and supporting columns. As a result, Sanborn Fire Insurance Maps noted the building as fireproof. It is 60 by 150 feet, contains 6 stories and cost about $125,000 to construct in 1908. Another financial partner in the venture was Levi S. McCabe, of McCabe’s Department Store. Mr. McCabe wanted to enlarge the business district that was located primarily on 2nd Avenue. His investment in the Safety Building was intended to promote that expansion. The third original owner was the Rock Island Safety Deposit Company, who gave the building its name. Cervin sold his interests to McCabe heirs in 1923. The building remained under their control until 1975, when it was sold to a group of local businessmen. The upper stories have always been used for offices and the ground floor has seen both office and retail use. 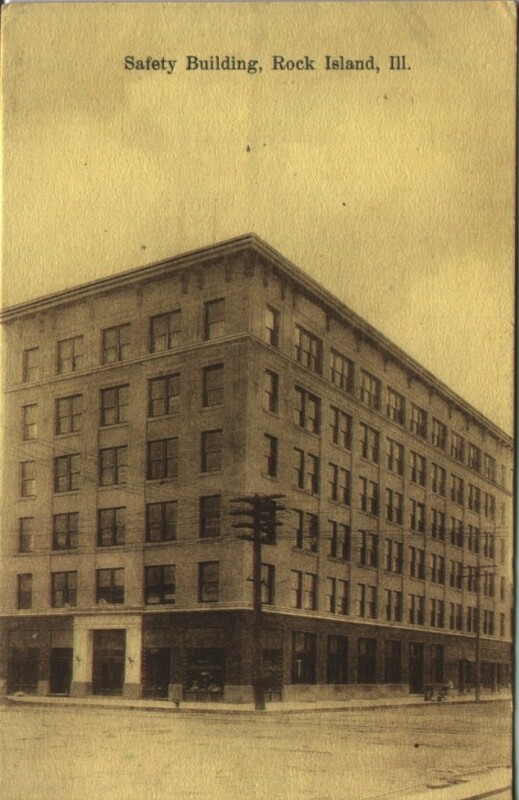 Initially, in addition to the Safety Deposit Company, other ground floor space was occupied by People’s Power Company (predecessor of Mid-American) and Tri City Railway Company (who built an amusement park at what is now Blackhawk Park to entice people to ride their streetcars there). The northeast corner was rented as a jewelry shop for many of its early years and, much later, a drugstore located there. For the first few years, the 6th floor was vacant, until it was occupied by Royal Neighbors of America, who also expanded to areas on the 4th and 5th floors before they built their own building (another postcard!). Other offices were occupied by insurance companies, doctors, dentists and attorneys. Architect Cervin reserved suite 401 for his architectural practice. He expanded his firm in 1915 by taking his first partner, Benj. A. Horn. Over the years new partners joined as old ones retired. Through it all, the firm remained in the Safety Building. Now the architectural practice begun by Cervin is known as Scholtz Gowey Gere Marolf or SGGM, and their offices are still here, but on the sixth floor. A closer look at the design of Safety Building reveals three distinct horizontal divisions separated by cast stone bands. Such a division of structure was becoming increasingly common in Chicago skyscrapers during this time. If we imagine the entire building represents a Greek or Roman column (look at a vintage porch to see different column styles), the divisions are immediately apparent as representing the base, the shaft (or pillar) and the capital (or top). In the Safety Building, the first story base is dark brick creating a visual heaviness that supports the building. The classically inspired entrance on the north (Third Avenue) is trimmed with shell-like carvings called anthemions. The middle shaft portion is four more stories high, with aligned windows accentuating the vertical rise. The buff colored brick used here has a slight surface irregularity and is assembled with very narrow mortar lines. Near the upper corners the bricks are laid so as to create an arrow-like relief. The arrows continue into the top story or capital, which is nicely finished with a bracketed cornice that is punctuated by recently restored electric lights. Since these cornice lights are unique downtown, it’s easy to speculate a connection between their use and occupancy of the building by People’s Power Company who sold electricity. Architectural changes to the Safety Building are minimal. The postcard shows the entrance to People’s Power on 3rd Avenue, near the corner of 19th Street. That entrance has now been shortened to a window and stucco covers the lower area of the first story at the corner and along 18th Street as well. Horizontal triple paned windows have replaced the original double-hung sashes, probably to help accommodate the small air conditioners. Otherwise the Safety Building is a pristine example of Rock Island’s own version of the skyscraper. If you’d like to know more about other downtown buildings, be sure to pick up a free copy of the Downtown Walking Tour booklets at the Preservation Commission kiosk at Rock Island’s downtown library. This article, by Diane Oestreich, is slightly modified from the original that appeared in the Rock Island Argus and Moline Dispatch on July 22, 2001.